With its dark taupe reclaimed wood-look top, this cocktail table gives an exceptional look to any room. Its original rectangular shape and chromed metal base provides sturdy support as well as a contemporary look. With its dark taupe reclaimed wood-look top, this cocktail table gives an exceptional look to any room. Its original rectangular shape and chromed metal base provides sturdy support as well as a contemporary look. Use this multi-functional table to compliment your living room. Relax in style and sophistication, and enjoy the outdoors with the Beacon Park Coffee Table. A sturdy, rust-resistant frame supports intricately woven, rich brown wicker, and features a slat top with a rustic finish. Use as a standalone piece, or include other Beacon Park furniture elements to create a complete look. Enjoy your outdoor space with the Hampton Bay Spring Haven patio furniture made with beautifully hand-woven wicker and durable steel furniture frames. The coffee table has a tempered glass inset and handy bottom shelves for extra storage. Perfect for your porch, patio or sunroom. Coordinate this table with other pieces in the Spring Haven Collection. End table, living room accent, or desk, the Irving coffee table is the perfect transitional piece to anchor your living space. Crafted to perfection, this Mid-Century classic showcases beautiful pine in a featured hollowed handle drawer to stow your favorite books, magazines, and other important items. Use it by an entryway or near your sofa, this piece blends well with any existing decor and its smooth table top finish will highlight framed photos, travel trinkets, vases, to instantly call it yours. Add a touch of sophistication to your home with this transitional style dark walnut accent chest. Featuring mirrored cabinet doors accented with classic brushed metal pulls and a hidden shelf behind, this piece is the perfect combination of elegance and functionality. With ample surface area for you to display pictures and decorative items, this chest will be the perfect addition to your bedroom, entryway, living or dining room. Wood-Look Coffee Table in Chrome & Dark Taupe With its dark taupe reclaimed wood-look top, this cocktail table gives an exceptional look to any room. Its original rectangular shape and chromed metal base provides sturdy support as well as a contemporary look. 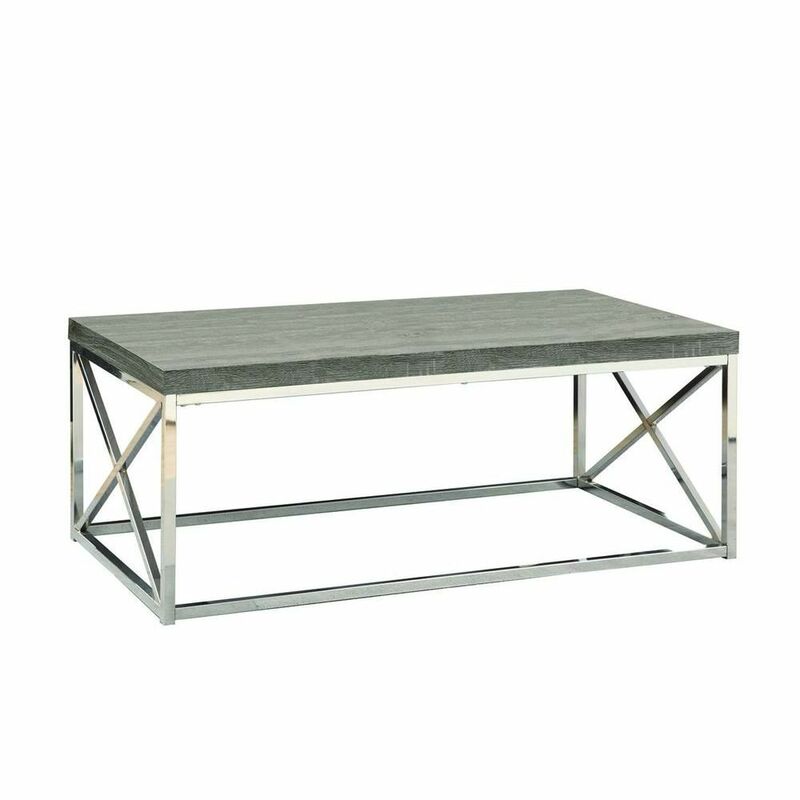 Wood-Look Coffee Table in Chrome & Dark Taupe is rated 4.3 out of 5 by 4. Rated 2 out of 5 by bryanne from Horrible Service the customer service aspect of purchasing this item was completely absurd and when I wrote you guys about it, no one got back to me despite me expressing this frustration over the phone and by e-mail to the customer service. The table appears to be a different colour online than it is in person as well. I am satisfied with the table I have but would never shop with you again. Rated 5 out of 5 by Buyer from Excellent coffee table I loved the look. It was very nice and high quality. However, I had to return because it was too small for me. Rated 5 out of 5 by TAnn from Easy to assemble and looks great!... Easy to assemble and looks great! Rated 5 out of 5 by Rflash from Love it! Questioned if something in a box could be quality but it was. We love it! Bought the entire set and happy with all five pieces.